All my favorite ingredients in traditional salad nicoise tossed in a fresh herb vinaigrette. For the dressing:Process shallot, garlic, mustard, thyme, 1/2 teaspoon salt, and 1/4 teaspoon pepper in blender until shallot and garlic are finely chopped, about 15 seconds. Add basil and parsley and blend till smooth. With blender running slowly pour in the oil and blend until emulsified, about 15 seconds. Meanwhile, place potatoes in cold water to cover. Bring to a boil and cook until tender. About 15-20 minutes until they pierce easily. Drain potatoes and transfer to a bowl. Toss with 1/4 cup of the fresh herb vinaigrette. Place a steamer basket in a large pot and bring water to a boil. Add the green beans and cook until they are bright green and just tender, about 5-7 minutes. Transfer beans to bowl with potatoes and toss to combine. Toss 1/4 cups of the vinaigrette with tuna, gently flaking apart with a fork. Toss greens with vinaigrette until lightly coated and divide amongst individual plates. 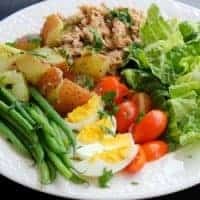 Arrange potatoes and beans, tuna, eggs, tomatoes, and olives over greens.